This large hermit is made distinctive by its over-sized almond-shaped black eyes. Its right claw is larger and stouter than its left, and both have a dense cover of spines over their dorsal surface. Its claws and its legs are banded with orange. It greatly prefers to inhabit moon snail (Euspira spp.) shells. Small juveniles may have partially yellow corneas. The blackeyed hermit inhabits sandy, muddy, shell, and gravel-bottomed habitats from the intertidal to about 150 m deep. It is found along sheltered shorelines from Unalaska Island, Alaska to San Diego, California. 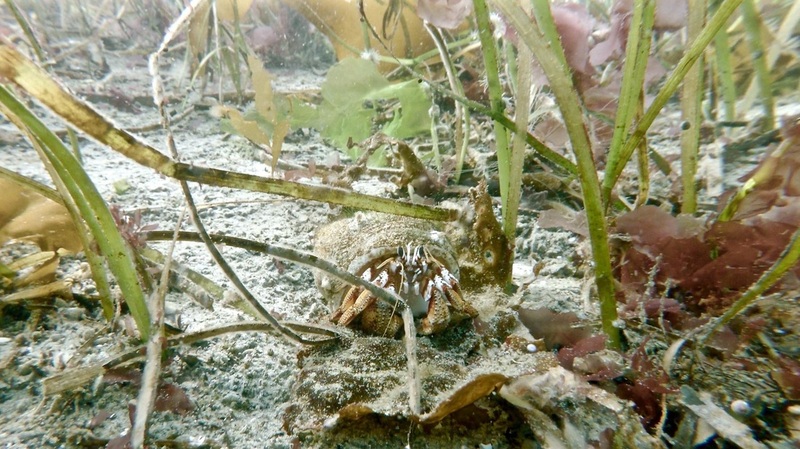 It is one of the more common hermit crabs in the Pacific Northwest. A blackeyed hermit male will drag a pre-moult female around for days, so he can be nearby when the female has moulted and is once again available to mate. Hart, J. Pagurus armatus (Dana, 1851). In Klinkenberg, Brian. (Ed.) E-Fauna BC: Electronic Atlas of the Fauna of British Columbia. Lab for Advanced Spatial Analysis, Department of Geography, University of British Columbia, Vancouver. Accessed 02/11/2015. Jensen, G.C. (1995). Pacific Coast Crabs and Shrimp. Monterey, CA: Sea Challengers. P. 64.